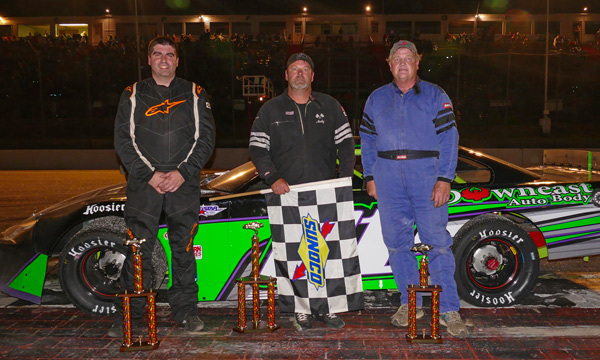 Oxford, Maine - Andy Saunders of Ellsworth got out in front of the field early, and then cruised to an impressive victory in the 50-lap Budweiser Championship Series Super Late Model main event on Monday night at Oxford Plains Speedway. An early restarted aided Saunders' effort to get from his fifth starting position into the race lead. He then built a seven-second lead over a torrid battle for second between veteran racers Alan Wilson of Hebron and Buckfield's Timmy Brackett. Super Late Model championship leader Alan Tardiff of Lyman, blocked in traffic for much of the race, came from eighth starting position to claim runner-up honors. Wilson's third-place finish was his best thus far in 2017. 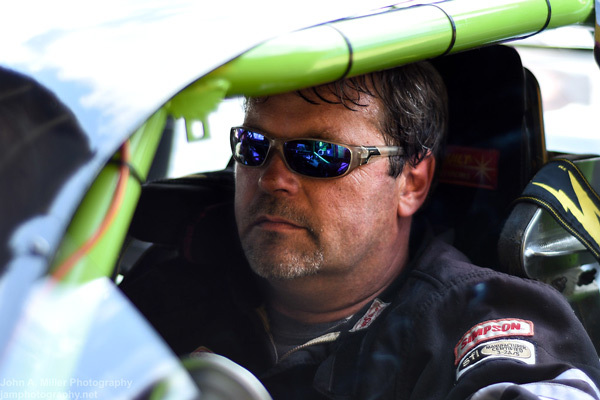 JT Thurlow of Windham posted s season-best fourth-place finish, while reigning Oxford Plains Speedway Super Late Model champion Brackett filled out the top five. Glen Luce of Turner and Dixfield's Scott Robbins won 12-lap heat races. 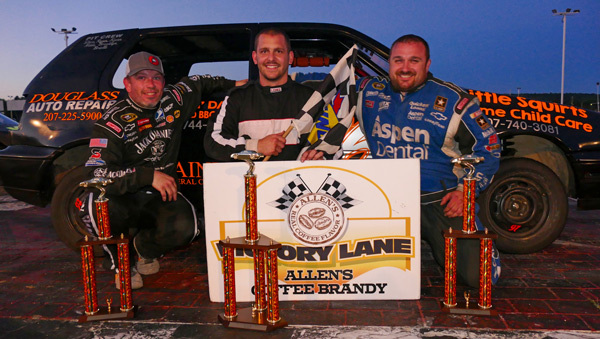 Points leader Billy Childs, Jr. of Leeds started dead last and needed almost all of the 30-lap distance to score yet another main event victory in the Allen's Coffee Flavored Brandy Street Stock division. Rick Spaulding jumped out in front of the field at the start of the race and stayed there until Childs worked his way by with about three laps to go. Spaulding earned runner-up honors, with Bridgton's Bryce Mains ending up in third after spending a lot of time in the outside groove. Matt Dufault of Turner charged from the back of the pack after an early pit stop and finished fourth. David Whittier of West Poland rounded out the top five. Spaulding and Childs won the 10-lap heat races for the Street Stocks. Tyler Green of Turner bounced back from flipping his racecar a couple of weeks earlier to dominate the action in the 20-lap feature race for Bandits division competitors. It was the first victory this season for last year's runner-up in the Bandits division championship battle. Former division champion Shaun Hinkley of Oxford was the best of the rest, with Adam Sanborn, also known as Larry Bandito, claiming the third-place trophy. Brandon Varney was fourth under the checkered flag, with the top-five rundown completed by Chad Wills of Oxford. Cam Childs of Leeds and top-ranked rookie Eric Stoddard of Paris were heat race winners in the Bandits division. Kyle Kilgore of South Paris nailed down a career-first victory in the 15-lap Figure 8 race. Kilgore quickly took command of the race and outran points leader Tommy Tompkins of Carthage to the checkered flag. David Smith of South Paris finished in third position, ahead of Oxford's Kyle Glover and Eric Hodgkins of Minot. The Budweiser Championship Series continues on Friday, July 7 at 7:00 p.m., with Fan Appreciation Night, featuring the weekly Budweiser Championship Series classes, topped by the the Super Late Models. 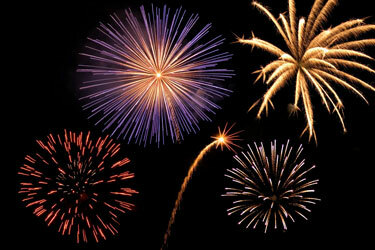 Grandstand tickets are two for the price of one for this special, Friday night event. Oxford Plains Speedway is located at 877 Main Street, on State Route 26 in Oxford, Maine. For more information, please visit oxfordplains.com or call (207) 539-8865. Budweiser Championship Series stock car racing results from Oxford Plains Speedway; Oxford, Maine; Monday, July 3, 2017 showing finishing position, car number, driver's name, driver's hometown. Super Late Model (50 laps) 1 01 Andy Saunders, Ellsworth; 2 9 Alan Tardiff, Lyman; 3 53 Alan Wilson, Hebron; 4 9 JT Thurlow, Windham; 5 60 Tim Brackett, Buckfield; 6 94 Shawn Martin, Turner; 7 61 TJ Brackett, Buckfield; 8 23 Dave Farrington, Jr., Jay; 9 6 Travis Dunbar, Auburn; 10 44 Kyle Treadwell, Buckfield; 11 72 Scott Robbins, Dixfield; 12 7 Glen Luce, Turner; 13 8 Calvin Rose, Jr., Turner. 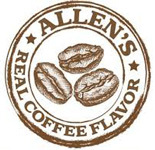 Allen's Coffee Flavored Brandy Street Stock (30 laps) 1 1 Billy Childs, Jr., Leeds; 2 36 Rick Spaulding, Lisbon; 3 77 Bryce Mains, Bridgton; 4 61 Matt Dufault, Turner; 5 58 David Whittier, West Poland; 6 39 Gerry Freve, Buckfield; 7 35 Christina Nadeau, Buxton; 8 27 Patrick Thorne, Standish; 9 2 John White III, Auburn; 10 09 Mark Turner, Norway; 11 42 Kim Tripp, Oxford; 12 11 Tyler King, Livermore; 13 56 Mike Short, Auburn; 14 14 Anthony Constantino, Sumner. Bandits (20 laps) 1 26 Tyler Green, Turner; 2 2 Shaun Hinkley, Oxford; 3 51 Adam Sanborn, West Paris; 4 1 Brandon Varney, Auburn; 5 52 Chad Wills, Oxford; 6 5 Jacob GHall, Oxford; 7 3 Chachy Hall, Oxford; 8 24 Travis Verrill, South Paris; 9 36 Scott Jordan, Auburn; 10 04 Tyler Jalbert, Auburn; 11 05 Gerard Cote, Oxford; 12 56 Addie McDaniel, Bridgton; 13 18 Brian Hiscock, Turner; 14 55 Dean Jordan, Jay; 15 49 Jacob Dobson, Hartford; 16 95 Eric Stoddard, Paris; 17 33 Matt Hiscock, Turner; 18 13 Bill Grover, Waterford; 19 77 Rob Crepeau, Minot; DQ 11 Cam Childs, Leeds. 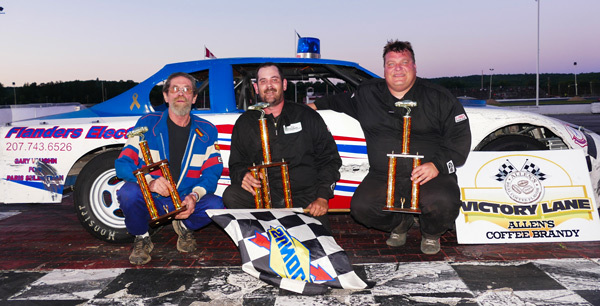 Figure 8 (15 laps) 1 4 Kyle Kilgore, South Paris; 2 27 Tommy Tompkins, Carthage; 3 54 David Smith, South Paris; 4 07 Kyle Glover, Oxford; 5 97 Eric Hodgkins, Minot; 6 41 Greg Durgin, South Paris; 7 40 Robert Morey, Lisbon; 8 2 Dale Lawrence, Lisbon.